The Florida viceroy butterfly, Limenitis archippus floridensis, is in the Nymphalidae, or brush-footed butterfly, family. It occurs in central and south Florida. Being that their larval food source are willows they are generally found along the edges of ponds, canals, river banks, wetlands, marshes and wet meadows where willows grow. 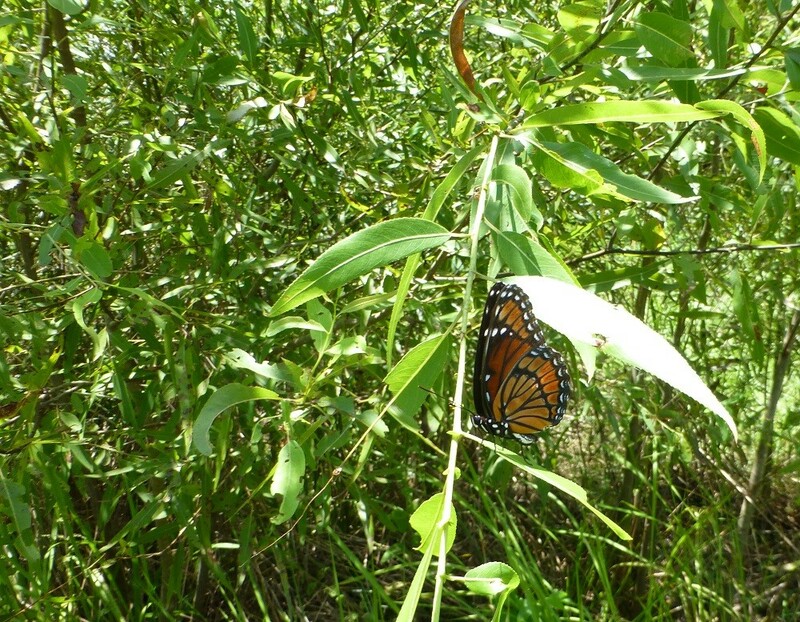 The Florida viceroy is not a regular sight in most gardens unless there are willows available for its use. The Florida viceroy mimics the coloration of the monarch and queen butterflies. The theory is that since queens and monarchs are poisonous and distasteful, to predators, that the viceroy will also gain the same protection. However, recent research has shown that viceroys are actually poisonous to predators as well and not just mimicking to avoid predation.They are 2 ½ to 3 1/2 inches in size. 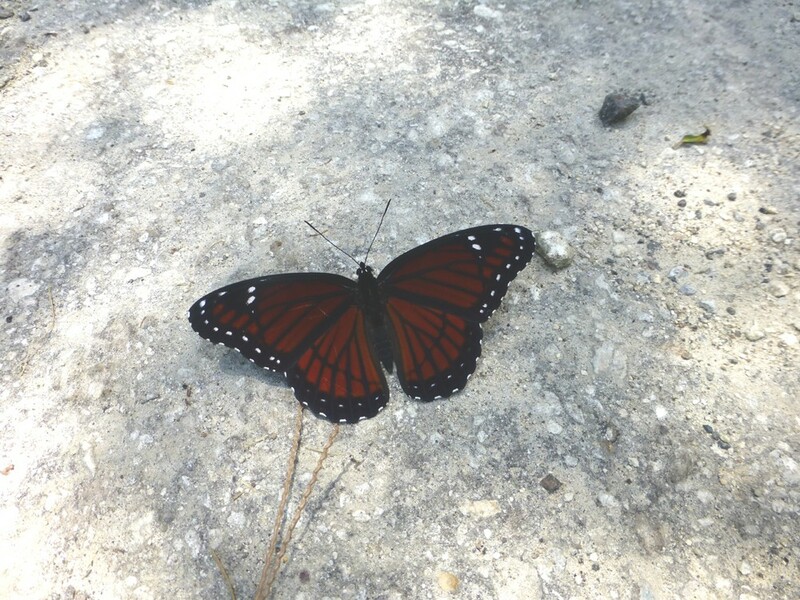 The Florida viceroy’s coloration is a dark rust-brown color mimicking the monarch and queen butterfly. They have black lines and black wing borders. The outer edge of their inner wings has a wide black border with oval to round white spots and the outer wings have V shaped to crescent shaped white spots. They also have a black line across their hind wings that runs parallel to the outer wing edge. There are six other subspecies of viceroy and some are quite varied in coloration. They range in color from dark rust to pale orange to almost tan. Some have little to no second black line running parallel to the outer wing edge making them appear very similar to the soldier butterfly. There is a wide variation in color from subspecies to subspecies. In addition to the nominative Limenitis archippus archippus … described from New York, which merges in Georgia with Limenitis archippus floridensis … there are several other more local subspecies. Limenitis archippus obsoleta … flies in Utah and Arizona and is of conservation concern due to loss of habitat. Limenitis archippus hoffmanni … is found in Mexico; Limenitis archippus watsoni … was described from Louisiana. Limenitis archippus idaho … and Limenitis archippus lahontani … were the most recently described subspecies – both found exclusively in Nevada. 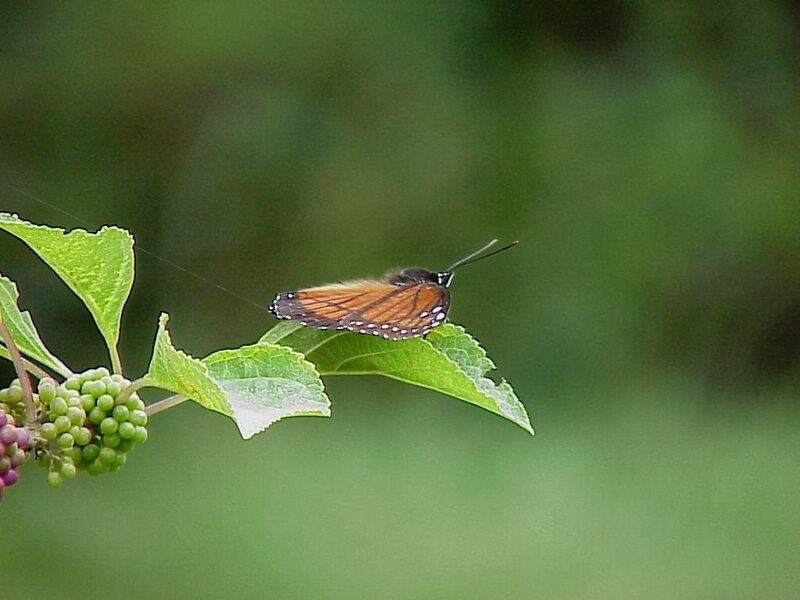 When flying, the Florida viceroy tends to glide along with rapid wing beats in between to gain momentum. Males are generally found roosting along the edge of their territory watching for intruding males which they swiftly chase away before returning to their patrolling site. Females are in constant search of a food source on which to lay their eggs and in Florida their larval food source is the willow and poplar. Willows are in the Salicaceae family. In central Florida our two native willows are the coastal plain, or Carolina willow (Salix caroliniana) and the Florida willow (Salix floridana). A common non-native species of willow is the weeping willow (Salix babylonica). Some references list viceroy butterflies as using poplar trees as host plants as well. Poplar trees that are native to central Florida are Populus alba (white poplar) and Populus deltoids (Eastern cottonwood). Caterpillars resemble a bird dropping and are mottled shades of brown and white. Just behind the head are a pair of tubercles (small protuberances) that resemble sticks. The caterpillars go through five instars. If young caterpillars hatch in late fall, and are not able to complete their five instars they will hibernate until spring by making a shelter of folded leaves and silk to protect themselves against the cold until spring arrives and they can begin feeding again. The Florida viceroy chrysalis looks like a combination of a bird dropping and brown leaf. The Florida viceroy nectars on many species of flowers and trees that grow in wet areas and will also feed on rotted fruit and carrion. They also visit mud puddles to procure moisture and minerals.